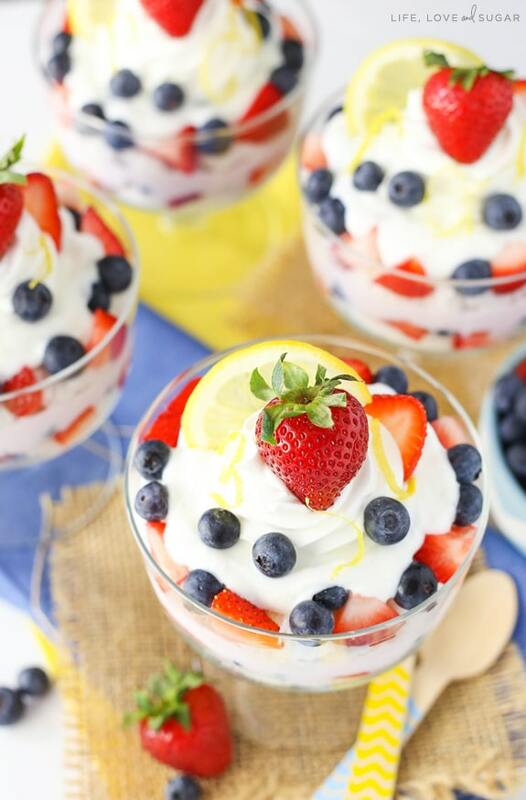 These Lemon Berry Yogurt Trifles are a light and fun treat! With layers of angel food cake, yogurt and fresh berries, they’re easy to make. 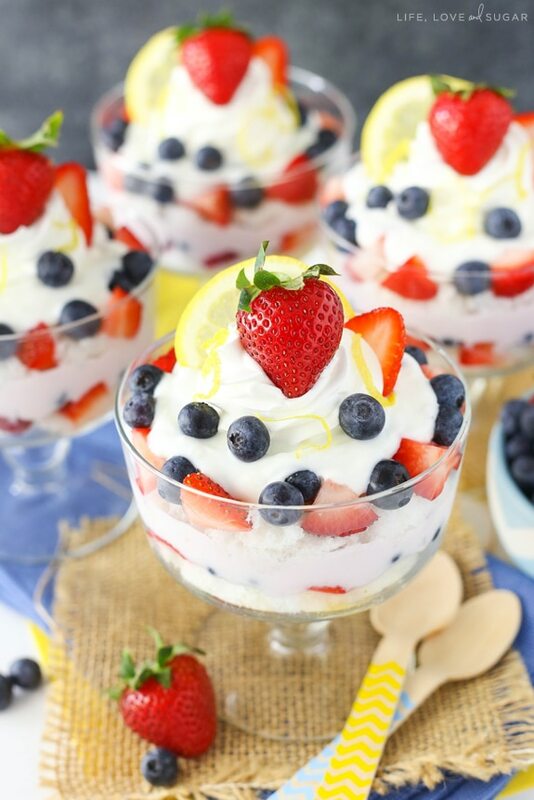 Trifle recipes are perfect for summer too! 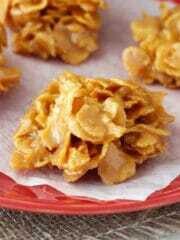 I am a big fan of simple treats. Yes, I love my tall and fun layered cakes for events and occasions, but for the everyday simple is the way to go. 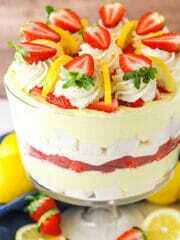 One of the best things about these trifles is that they can be put together really quickly. 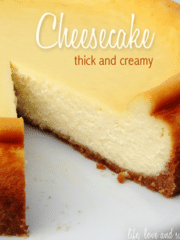 Not to mention that the layers are full of fun flavors and nearly guilt free. 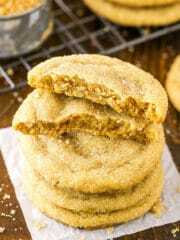 🙂 They make a great snack – or dessert! To start, you’ve got layers of angel food cake. 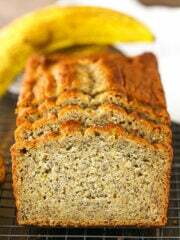 It’s one of the lightest cakes you can eat, which is great for the warm weather and for snacking. 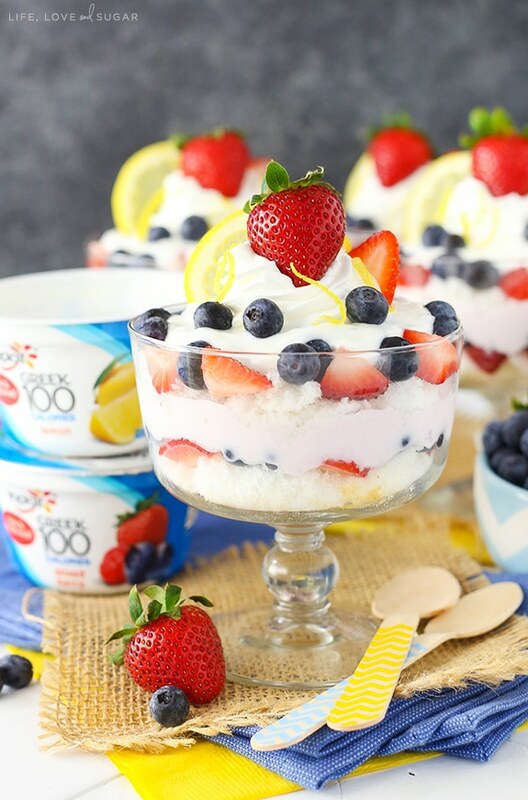 It’s layered with two different flavors of Yoplait Greek 100 – Mixed Berry and Lemon. There’s a layer of each in each trifle, so you end up with about 1 full yogurt cup in each trifle. Both flavors are SO good! You know I love my berries and lemon! In fact, if you wanted to change the flavors up a bit you totally could. Yoplait has such a great variety of 100+ flavors to choose from. 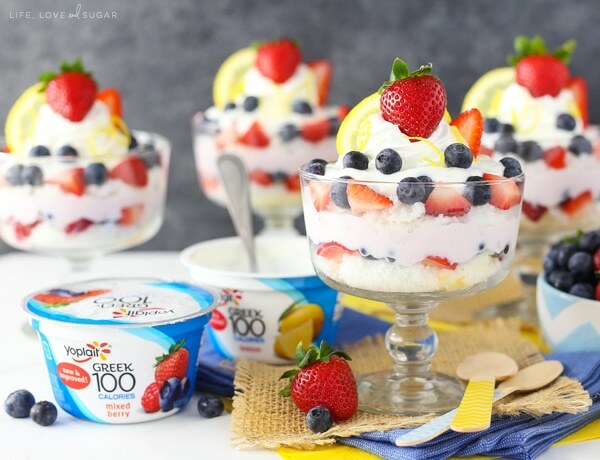 You could try pineapple and coconut Greek 100 yogurt and make a piña colada trifle! You can even swap out the berries for another fruit. 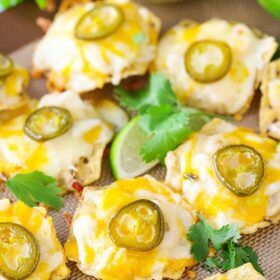 So many fun combinations and possibilities! If you’ve never tried Greek yogurt, you totally should. 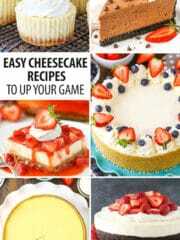 My mom got me hooked on it a few years ago and it works perfectly in these trifles. 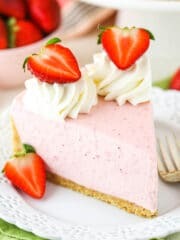 Although I typically think of having yogurt for breakfast, it adds great flavor to baked goods and desserts. 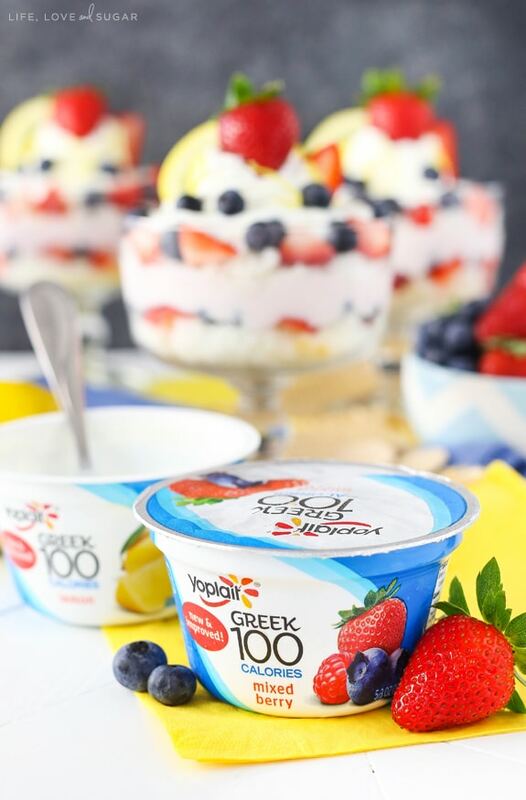 Using the Yoplait Greek 100 is great with its thicker texture. Try all of Yoplait’s 100+ flavors for a chance to win $100,000. Simply enter the code on top of specially marked lids at Yoplait.com/100Ways and you could win one of more than 3,000 prizes. 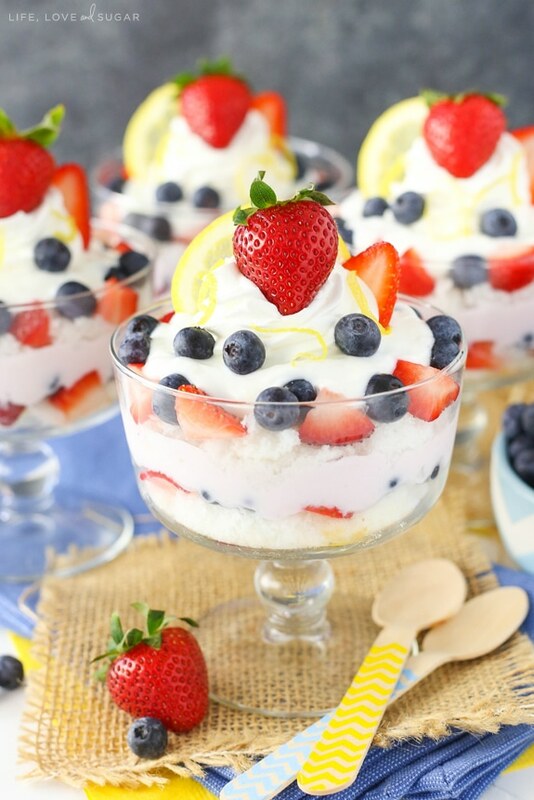 Lemon Berry Yogurt Trifles are a fun treat! 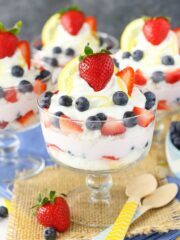 With layers of angel food cake, yogurt and fresh berries, trifle recipes are perfect for summer! 1. Set out 4 trifle dishes. 2. 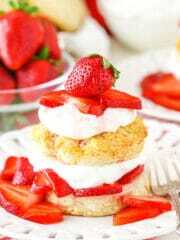 Add a layer of angel food cake in the bottom of each dish. 3. Top the angel food cake with a layer of strawberries and blueberries. 4. Add a layer of mixed berry yogurt, about half of one container. 5. 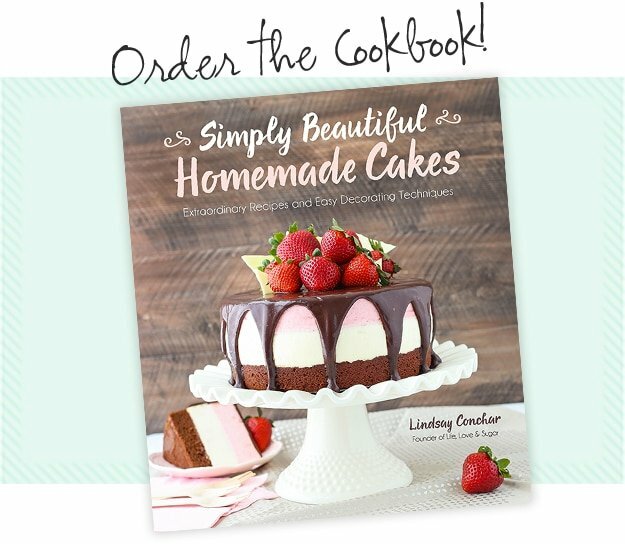 Repeat the layers of angel food cake and strawberries and blueberries. 6. Add a layer of lemon yogurt, about half of one container. 7. 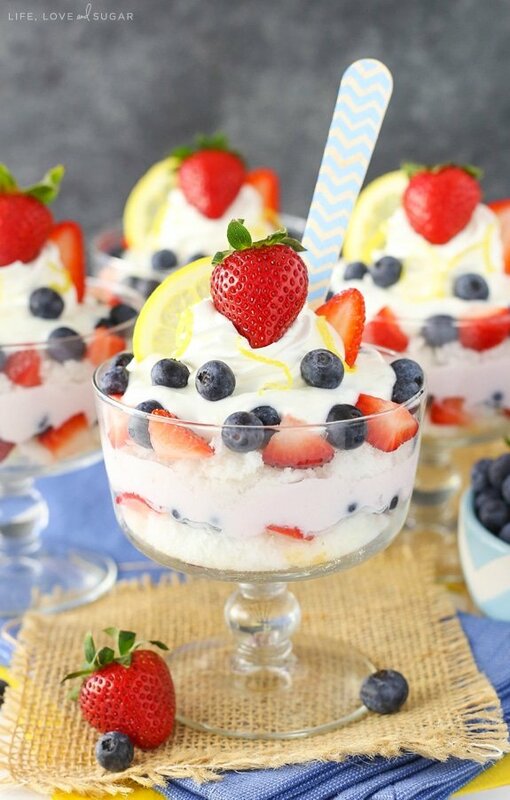 Top the trifles with a swirl of whipped topping, a lemon slice and a few more berries. So pretty! 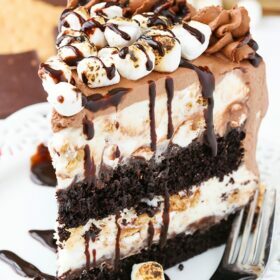 And with angel food cake, this looks light and sublime. Gorgeous pics! Gorgeous! 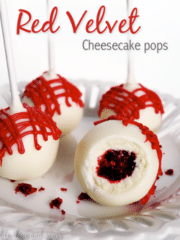 Sounds like the perfect simple treat!